Converter hall of the converter station Baixas at the French side of the HVDC transmission link between France and Spain. The foundation stone of the future converter station was laid on the morning of February 23rd in Folkestone by Jesse Norman, Minister for Industry and Energy signalling the start of the construction work for high-voltage direct-current (HVDC) project ElecLink. 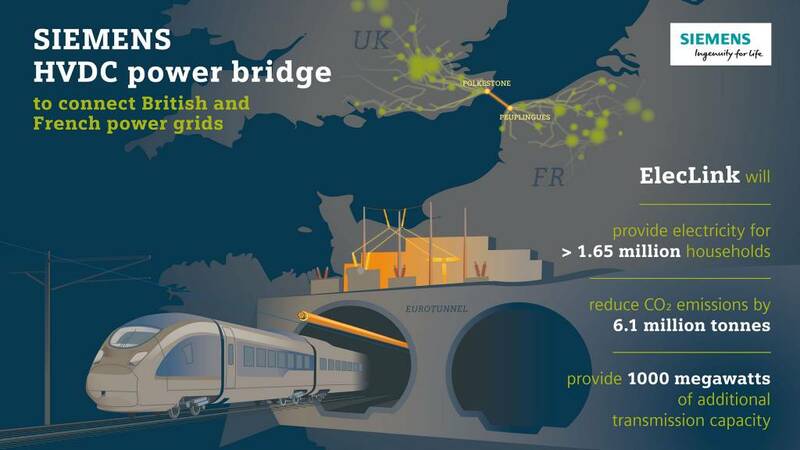 Siemens has been awarded an order to supply a link between the French and British power grids by customer ElecLink Limited, a wholly owned subsidiary of Groupe Eurotunnel SE. The ElecLink high-voltage direct-current (HVDC) link will enhance power supply reliability in both countries and promote the integration of renewable energy sources into the power grid. ElecLink, when complete, will supply enough electricity to power more than 1.65 million typical households per year. The HVDC link between France and Great Britain has been designated as one of the European Commission's projects of common interest to help create an integrated European Union energy market. Siemens has been awarded an order to supply a link between the French and British power grids. The customer is ElecLink Limited, a wholly owned subsidiary of Groupe Eurotunnel SE. The "ElecLink" high-voltage direct-current (HVDC) link will enhance power supply reliability in both countries and promote the integration of renewable energy sources into the power grid. Siemens is to supply eight converter transformers for the Nemo Link project, a high-voltage direct current (HVDC) transmission system connecting Belgium and Great Britain. The customer is Nemo Link, a joint venture between National Grid Nemo Link Limited, a subsidiary company of the UK's National Grid Plc, and the Belgian Elia Group. In Munich today, Siemens will present its "full bridge technology," which will be used in the latest generation of converter stations. In October, Siemens was already awarded a contract worth €900 million to build two converter stations for the ULTRANET direct-current project.